With so many different mediums out there, proper levels have never been more important. 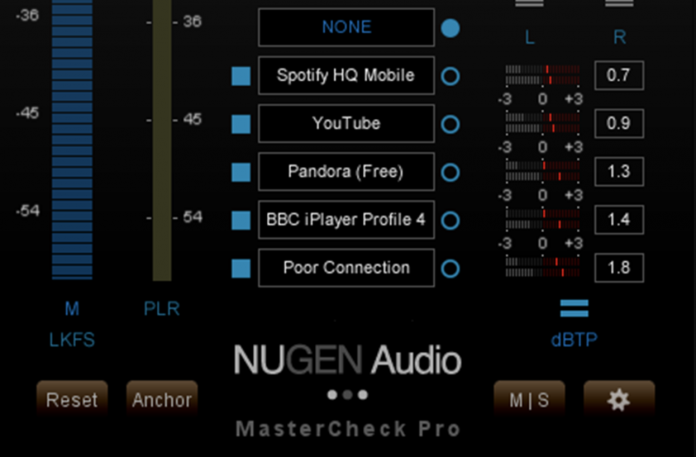 Nugen Audio has added a few new tricks to MasterCheck Pro to accommodate the ever changing landscape. The term codec is an acronym for coder/decoder. Music streaming services such as Apple Music® and Spotify use codecs to reduce the data bandwidth required to stream audio to the consumer. Codecs affect audio quality, so it is important to be able to audition them in realtime in a DAW (Digital Audio Workstation) in order to mitigate side effects caused by intersample clipping and bit depth reduction. Ultimately, Version 1.5 of MasterCheck Pro places two important improvements in the hands of eager-eared engineers keen to tackle advancing audio frontiers. Firstly, now that MasterCheck Pro supports the Apple AAC iTunes Plus native OS X codec, people producing to the MFIT (Mastering for iTunes) standard can take advantage of real-time monitoring of the native Apple codec in OS X — and all from within the comfort of their chosen DAW. Updating MasterCheck Pro to Version 1.5, NUGEN Audio are advancing this essential mix optimisation toolset for mixing and mastering in accordance with today’s increasingly streaming serviced-society so that the likes of GRAMMY® Award-winning mix engineer Dave Pensado can continue to deliver music mixes safe in the knowledge that their work will work… wherever it is being streamed. Straightforward and intuitive to use, Version 1.5 of MasterCheck Pro will be showcased by NUGEN Audio on booth #14005 at The 2018 NAMM Show, January 25-28 in Anaheim, California. Come check it out! MasterCheck Pro is available to purchase as a 32- and 64-bit-supporting AAX-, AU-, VST-, and VST3-compatible plug-in for Mac (OS X 10.7 and above) and Windows (Vista and above) directly from NUGEN Audio for £126.00 GBP (ex. VAT)/$199.00 USD/€155.00 Euro (ex. VAT).